In 1988, Dallas businessman Jim Sowell was moved by his concern for the problems associated with homelessness and poverty. He took action in response to the human suffering he observed by working with friends to launch the Central Dallas Food Pantry in a strip shopping center at Henderson and Central Expressway. In 1990, the organization received status as a 501 (c) 3 non-profit corporation and, due to its growth, relocated to larger quarters at 801 N. Peak in East Dallas. In August 1994, current President and CEO, Larry James, joined the organization. Shortly afterwards, Central Dallas Food Pantry began doing business as Central Dallas Ministries and the organization acquired an additional building at 409 N. Haskell, the current location of its food pantry. 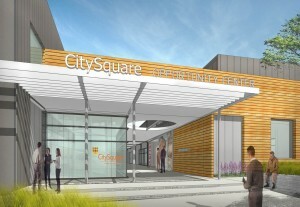 On Monday, October 25, 2010 Central Dallas Ministries officially launched under the new name CitySquare. CitySquare offers a variety of poverty-fighting programs throughout Dallas as well as in Houston, San Antonio and Austin, based on four core values: Community, Faith, Justice and Stewardship. 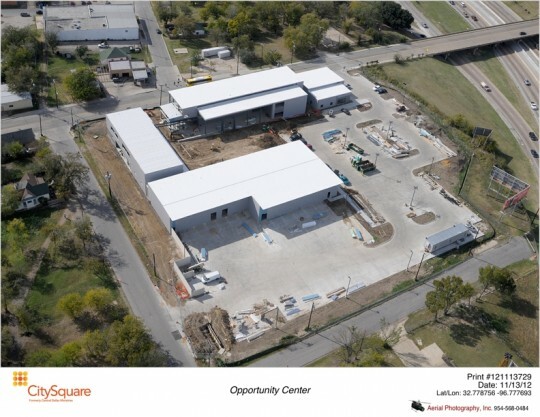 In February, 2012, CitySquare partnered with Crescent Growth Capital (“CGC”) to develop a financing package for a comprehensive “Opportunity Center” at the Southeast corner of I-30 and Malcolm X Blvd. The Opportunity Center, a joint effort between CitySquare, PepsiCo, Inc., and Workforce Solutions of Greater Dallas, is a $14MM multi-service 52,000 square foot facility. It will provide a food distribution center, a new state of the art wellness center, a comprehensive employment training center that will house new offices for Work Force Solutions of Greater Dallas and CitySquare’s WorkPaths employment training division, CitySquare’s AmeriCorps headquarters/offices, and staging areas for CitySquare’s growing Summer and After-School Feeding Program funded by the Texas Department of Agriculture. 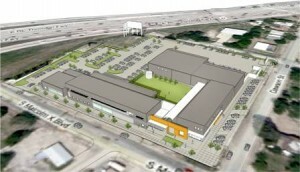 In addition, the Center will place key services and economic opportunities in one central location. Currently, our Resource Center/Food Pantry, wellness activities and WorkPaths employment program are located in three separate facilities. Centralizing these key services will create greater economies of scale in staff and resources, and allow us to serve more of our neighbors. Moreover, the Center will leverage our existing partnerships to promote greater stability in the workforce, the programs at the Center, and the overall community. In June, 2013, CGC helped CitySquare and its partners close and fund a $12.5MM Federal Qualified Equity Investment, utilizing a $12.5MM allocation of Federal New Markets Tax Credits, provided by the Dallas Development Fund, and leveraging $4.1MM of NMTC equity provided by AT&T Corp.